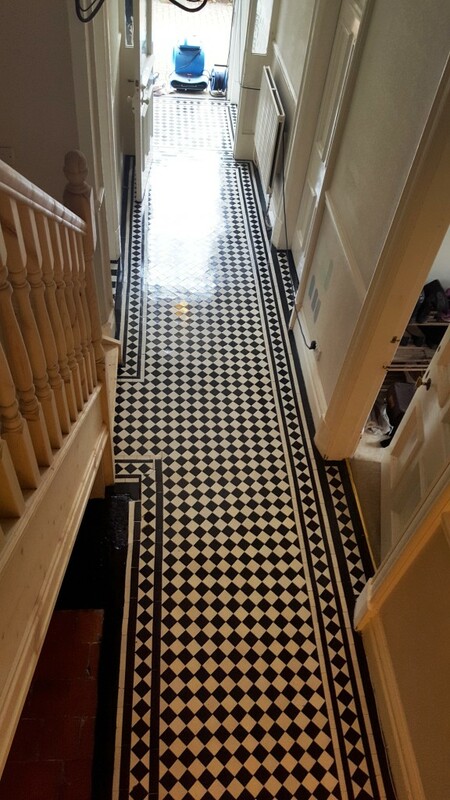 This fantastic chequered black and white Victorian Tiled Hallway was located at a house in the village of Prestbury north of Macclesfield in Cheshire. According to Wikipedia Presbury is part of the “Cheshire Golden Triangle” villages which include Wilmslow and Alderley Edge which are the most sought after and expensive places to live outside of London. It was a lovely building however a new stair case had been fitted which didn’t quite match the foot print of the original staircase leaving a gap in the hallway tiling. 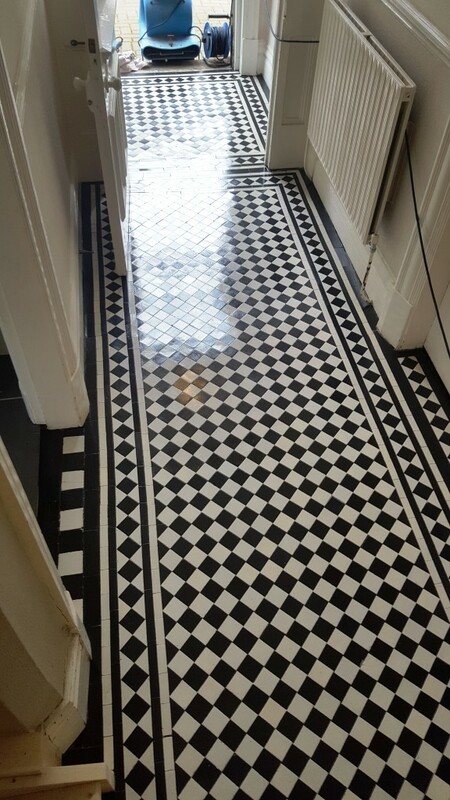 The owner of the property wanted matching tiles fitted and also to give the floor and good clean and seal so they would blend in. To clean the floor and strip off any remaining sealer I first created a strong dilution of Tile Doctor Pro-Clean cleaning solution which is a versatile alkaline cleaner that’s designed for use on tile, stone and grout. reliably eradicates dirt on a wide variety of natural stone floors. 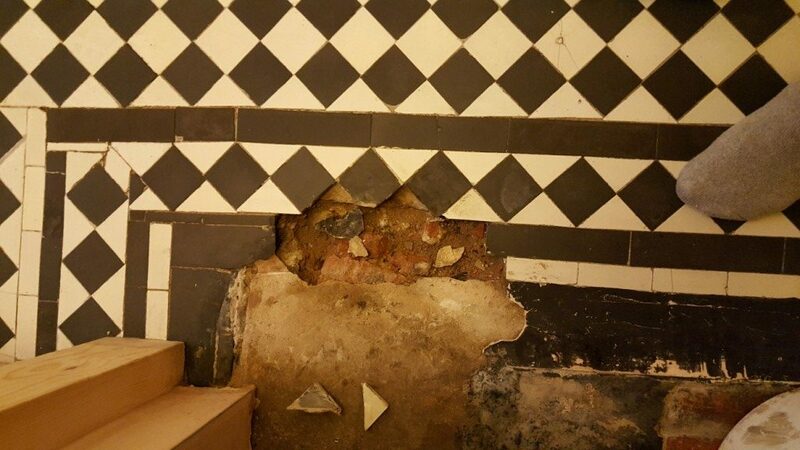 The solution was applied liberally across the floor, and left to dwell for about ten minutes to allow time for it to soak into the Victorian tiles. It was then scrubbed into the tiles using a scrubbing pad fitted to a rotary cleaning machine. The resulting cleaning slurry was rinsed off with water and then extracted from the floor using a wet vacuum. I repeated this process until I was confident the tiles were clean and free of old sealer. The next step was to treat the floor to an acid wash using Acid Gel, this is especially important on old floors where there is no damp proof course to prevent damp rising through the tile leaving salt deposits on the surface. This problem is known as efflorescence and is neutralised by the acid. The gel was then removed and the floor given another rinse using the wet vacuum to get the floor as dry as possible. The last task of the day was to fix replacement tiles in the gap left by the original staircase. Fortunately, Tile Doctor keep a range of replacement tiles so I was able to source some that matched without too much problem. After grouting the hallway was left to dry off fully overnight so it could be ready for sealing the next day. The next morning, I returned to the property and ran some damp tests. This is incredibly important to do before sealing any tiled floor because any excess moisture can cloud the sealer and prevent it from doing its job properly. Once satisfied that the floor was dry, I applied a single coat of Tile Doctor Colour Grow which is a breathable impregnating sealer that enhances colour and protects from within. I dusted off any excess sealer and then followed up with the application of four coats of Tile Doctor Seal and Go which provides both a robust surface seal and a long-lasting low sheen finish. I waited two hours for the sealer to dry and then the rotary machine fitted with a white buffing pad over the floor to makes sure everything was nice and tight. 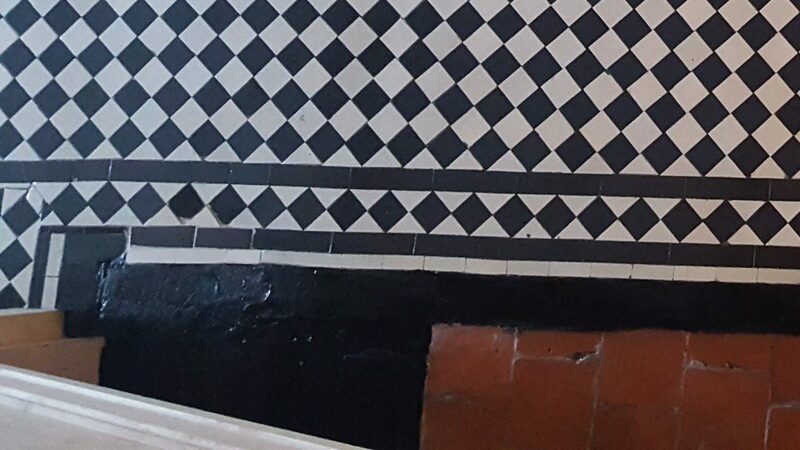 This entry was posted in Victorian Posts and tagged Alderley Edge, Chequered, cheshire, efflorescence, hallway, Macclesfield, Pennines, Prestbury, Repair, Tiled, victorian, Wilmslow by AbzDominise. Bookmark the permalink.